Last updated on: as of 15 April 2019[update]. This name uses Spanish naming customs: the first or paternal family name is Ferrer and the second or maternal family name is Ern. David Ferrer Ern (Valencian pronunciation: [daˈvit feˈreɾ ˈɛɾn]; Spanish: [daˈβið feˈreɾ ˈɛɾn]; born 2 April 1982) is a Spanish professional tennis player who is currently ranked world No. 152 in men's singles by the Association of Tennis Professionals (ATP). A three-time Davis Cup champion with Spain, Ferrer has won tournaments at all levels (ATP 250, ATP 500, Masters 1000) except at a Grand Slam, and currently has the seventh highest career prize money earnings of all time among male tennis players (when not adjusting for inflation). 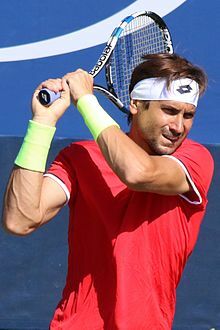 Ferrer also holds the distinction of winning the most matches on the ATP tour without having won a Grand Slam tournament, passing Brian Gottfried who held this record for 32 years. Ferrer was born in Xàbia in the province of Alicante, but he moved to Gandia at age thirteen, followed two years later by a move to Barcelona to attend the Catalan Tennis Federation. He spent nine months at Equelite, Juan Carlos Ferrero's Academy in Villena, before moving back to Xàbia. During his time in the academy, the Spanish Federation chose to sponsor Tommy Robredo rather than him, forcing Ferrer on his own prior to turning professional. Once, as a teenager, when Ferrer did not practice hard enough, his coach, Javier Piles, locked him in a completely dark 2m x 2m ball closet for several hours, giving him only a piece of bread and a bit of water. After this incident he was fed up with tennis and went to work at a construction site, but after a week he returned to Piles and asked if he could remain at the club and play tennis. Piles continued to coach Ferrer until they parted ways at the end of 2013. Ferrer has said he considers Piles to be like a second father to him. Ferrer turned professional in 2000, finishing as world no. 419, winning in Poland F1 and Spain F3, finishing runner-up in Spain F1. 2001 was not a particularly good year for him. He won his first career Challenger title in Sopot and reached the semifinals at Manerbio. He also reached the semifinals in Spain F15 and Spain F16. In 2002, he played consistently in ATP (10–6) and Challenger (35–13) tournaments, winning his first ATP title in Bucharest (defeated José Acasuso) and reaching his first ATP final in just his second ATP event in Umag (defeated David Nalbandian and Guillermo Coria, lost to Carlos Moyá). He won Challenger titles in Naples, Valencia, and Sassuolo. All 10 ATP match wins and 34 of 35 Challenger wins came on clay. The highlight of 2003 was Ferrer's victory against Andre Agassi at the Rome Masters. He made his debut at all four Grand Slam tournaments, as well as six ATP Masters Series events. In Rome, he upset the defending champion Agassi in the first round and lost to Ivan Ljubičić in the second round. Ferrer advanced to the second round at the French Open and Wimbledon. He reached his third career final in Sopot and lost to Guillermo Coria. In doubles, he reached his first career final in Acapulco with Fernando Vicente. He compiled a 13–16 record on clay courts, 6–10 on hard, 1–1 on grass, and had a year-ending ranking of world no. 71. In 2004, Ferrer reached the quarterfinals in Buenos Aires, Valencia, and at the ATP Masters Series Hamburg (defeated no. 6 David Nalbandian, lost to Guillermo Coria). He advanced to the semifinals in Stuttgart (lost to Gastón Gaudio). Later in the year he advanced to the quarterfinals in Bucharest and the semifinals in Palermo (lost to Tomáš Berdych) and Lyon (defeated Juan Carlos Ferrero, lost to Xavier Malisse). He ended the year with a ranking of world no. 49. In 2005, Ferrer advanced to the semifinals in Miami by defeating David Nalbandian, Juan Carlos Ferrero, and Dominik Hrbatý, but lost to Rafael Nadal. He closed the year with a quarterfinal showing in Madrid, where he defeated Puerta, but lost to Robby Ginepri, and Paris, where he lost to Andy Roddick. He lost only once in the first round of nine Masters Series events, while compiling a 20–9 record. In doubles, Ferrer won his first two ATP titles in Viña del Mar and Acapulco (with Ventura) and earned a career-high US$951,772. He finished the year with a ranking of world no. 14. Ferrer opened the year with a quarterfinal showing in Auckland, where he lost to Olivier Rochus. He broke into the top 10 ATP rankings for the first time, following a personal-best fourth-round showing at the Australian Open, where he defeated Mario Ančić, but lost to Fabrice Santoro. He was in the top 10 for five weeks during the year. Then, playing in the first round of a Davis Cup tie versus Belarus, he went 2–3 indoors, losing to Vladimir Voltchkov in the second rubber. In March, he reached the semifinals in Miami for a second straight year, where he defeated no. 4 Andy Roddick, but lost to Roger Federer. In his second clay-court tournament of the year in Monte-Carlo, he lost to Federer. He also advanced to the quarterfinals at the Masters Series Hamburg, falling to eventual champion Tommy Robredo. In Düsseldorf, he posted wins over two top-10 players, world no. 4 Ivan Ljubičić and world no. 9 Fernando González. He reached the third round at the French Open and a career-best fourth round at Wimbledon, where he defeated González in the third round, but lost to Lleyton Hewitt. In July, he won a second career ATP title in a five-hour final in Stuttgart. He came back from two sets to one and a 1–5 deficit against Acasuso, saving one match point down 4–5 in the fourth set. In August, he reached the quarterfinals in Cincinnati, Ohio, where he defeated no. 10 Marcos Baghdatis, but lost to González, followed by a third-round showing at New Haven, where he lost to Agustín Calleri. At the US Open, he reached the third round for the second consecutive year, but lost to Mikhail Youzhny. Ferrer closed the year by reaching the quarterfinals in Basel, where he lost to Federer. For the year, he went 3–5 versus top-10 opponents and compiled records of 18–8 on clay and 17–13 on hard court. He finished the year ranked world no. 14 and in the top 15 for the second consecutive year. Ferrer began the year by winning Auckland, defeating Tommy Robredo in the final. At the 2007 Australian Open, he defeated Kristian Pless, Thomas Johansson, and Radek Štěpánek, and lost in the fourth round to Mardy Fish in five sets. One month later, he reached the quarterfinals at Rotterdam. He had quarterfinal finishes at Indian Wells and Monte-Carlo and reached the fourth round in Miami, the semifinals in Barcelona, and the quarterfinals in Hamburg. At the French Open, he was stopped by Fernando Verdasco in the third round. At Wimbledon, he was eliminated by Frenchman Paul-Henri Mathieu in the second round. In July, he captured his second title of the year and fourth of his career, beating Nicolás Almagro in the final of the Swedish Open in Båstad. He then advanced to the quarterfinals in Cincinnati, defeating Andy Roddick in the third round. At the US Open, he was seeded 15th and knocked out 24th-seeded David Nalbandian in the third round, and then upset second-seeded compatriot Rafael Nadal in the fourth round in four sets. He beat 20th-seeded Juan Ignacio Chela in the quarterfinals and reached his first Grand Slam semifinal, where he was defeated by third seed Novak Djokovic. His performance at the US Open brought his ranking up to world no. 8. Then, Ferrer captured his third title of the year in Tokyo, defeating Richard Gasquet in the final. At the Paris Masters, he made it to the quarterfinals, where he lost to David Nalbandian. Ferrer qualified as the sixth seed for the year-ending Tennis Masters Cup. To begin, Ferrer upset third seed Djokovic in his first round-robin match, and then defeated second seed Rafael Nadal. He sealed his qualification for the knock-out stage by defeating eighth seed Richard Gasquet. He was the only man to have a perfect record in the round-robin stage and had the best win/loss set record (6–1). Ferrer next defeated fifth seed Andy Roddick in the semifinals. In the final, Ferrer lost to top seed Roger Federer. He ended the year with a career-high ranking of world no. 5. Ferrer opened 2008 with a quarterfinal loss to unseeded Julien Benneteau of France in Auckland, where Ferrer was top seed. He reached the second week of the Australian Open, however, as the fifth seed, without dropping a set in the first three rounds. He then went on to defeat 22nd seed Juan Carlos Ferrero in four sets in the fourth round, before falling to third seed and eventual champion Novak Djokovic in the quarterfinals. On 25 February, Ferrer became world no. 4, despite losing in the second round in Rotterdam. On 20 April, he captured his first ATP title of the year, and the sixth in his career, when he defeated Nicolás Almagro in the final of Valencia. He saved three match points against Fernando Verdasco in the quarterfinals, and in the final, won the definitive set when he went down 5–2 in the third set, with two break points for Almagro. Ferrer arrived at the quarterfinals in the Monte Carlo Masters, losing against the eventual tournament champion Rafael Nadal, despite having five set points in the second set. In Barcelona the following week, Ferrer reached the final, after defeating Nicolás Lapentti, sixth seed Tommy Robredo, and fourteenth seed Stanislas Wawrinka. He again lost to Nadal in the final. Ferrer made it to the quarterfinals of the French Open, matching his previous best appearance in 2005. In his first two rounds, he defeated Steve Darcis and Fabrice Santoro. He then prevailed in two five-set matches over Lleyton Hewitt and Radek Štěpánek in the third and fourth rounds, respectively. He eventually fell to local favorite Gaël Monfils in four sets. Ferrer then began his grass-court season with another title at 's-Hertogenbosch in the Netherlands. He defeated Croatian Mario Ančić and Argentine Juan Martín del Potro en route to the final, where he won in straight sets over Frenchman Marc Gicquel. This was his seventh career title and the first on grass. With this win, he became the second Spaniard (after Nadal) to win a grass-court tournament after a 36-year drought. At Wimbledon, Ferrer was seeded fifth. In the first round, he defeated Sergiy Stakhovsky, who forfeited the match while down in sets 2–0 and up 3–1 in the third set. In the second round, Ferrer defeated Russian Igor Andreev in four sets. He was then eliminated by Ančić in the third round in four sets. Representing Spain at the 2008 Summer Olympics, Ferrer was eliminated by Janko Tipsarević in the first round. At the US Open, Ferrer reached the third round as the fourth seed, where he lost Kei Nishikori, ranked 126, in one of the biggest upsets of the tournament. Ferrer saved five match points before losing the match. Seeded first at the China Open in Beijing, Ferrer was defeated by Israeli Dudi Sela in the second round 3–6, 3–6. Following a first-round bye, sixth-seeded Ferrer lost in the second round of the Madrid Masters to fellow Spaniard Feliciano López 4–6, 6–7. Ferrer began his Season at the Heineken Open losing to Sam Querrey in the semifinals. At the Australian Open, he was upset by Marin Čilić in the third round. He then bounced back with a semifinal showing at the SA Tennis Open falling to Jérémy Chardy after dominating the first set, in a tightly contested second and third set. He reached his first final of the year at the Dubai Tennis Championships, losing to Novak Djokovic in straight sets. However, he bounced back defeating Novak Djokovic in a Davis Cup tie. At the Masters 1000 BNP Paribas Open and Sony Ericsson Open, he was able to reach the fourth round, losing to Andy Roddick and Juan Martín del Potro, respectively. In the clay season, Ferrer played his first event at the Monte-Carlo Rolex Masters. After cruising through the first two rounds, he was routed by Fernando Verdasco. He rebounded by reaching the final of the Barcelona Open Banco Sabadell, losing to Rafael Nadal in the final. However, the Spaniard suffered early loses at the Internazionali BNL d'Italia, Estoril Open, and Mutua Madrileña Madrid Open. At the French Open, he fell to surprise finalist Robin Söderling in the third round. He played his Wimbledon warm-up at the Ordina Open and was upset by compatriot Iván Navarro in the quarterfinals. At Wimbledon, Ferrer suffered another third-round loss in a Grand Slam, this time falling to Czech Radek Štěpánek in five sets. Ferrer then came back to clay at the International German Open, where he was able to reach his fifth semifinal of the year, but lost to Russian Nikolay Davydenko. However, the Spaniard had an abysmal US Open Series, losing in the third round of 2009 Western & Southern Financial Group Masters and in the second round of the Rogers Cup and the US Open. He then suffered back-to-back first-round loses at the Proton Malaysian Open and China Open, losing to Mikhail Youzhny and Fernando González. He also fell to eventual semifinalist Feliciano López in the second round of the Shanghai ATP Masters 1000. He was the defending champion at the Valencia Open 500, but withdrew prior to his second-round match against compatriot Albert Montañés due to a hamstring injury. He then helped Spain capture the Davis Cup title, when he defeated Radek Štěpánek in five sets. Ferrer lost in the second round of the 2010 Australian Open to Marcos Baghdatis, after winning the first two sets, in a match lasting just over four hours. Ferrer's next tournament was the SA Tennis Open. In the first round, he defeated Karol Beck. In the second round, he beat Filip Prpic, and then won his quarterfinal against Somdev Devvarman. However, in the semifinals, he lost to Stéphane Robert. Ferrer's next tournament was the Copa Telmex, where he was the top seed. He beat Simon Greul in the first round, and then defeated Frederico Gil in the second round. Ferrer then defeated Igor Andreev in the quarterfinals and went on to defeat Albert Montañés. However, in the final, he fell to Juan Carlos Ferrero. Ferrer's next tournament was the 2010 Abierto Mexicano Telcel, where he was the third seed. In the first round, he defeated Potito Starace and then defeated Thomaz Bellucci in the second round. He defeated Pablo Cuevas in the third round. In the semifinals, he defeated Fernando González. In the final, he avenged his previous defeat by Juan Carlos Ferrero for his eighth career title. This was Ferrero's third straight final and also ended Ferrero's 14-match winning streak. His ranking also rose to no. 16. In the first round of the 2010 Davis Cup, Ferrer defeated Marco Chiudinelli and then Stanislas Wawrinka to advance Spain to the quarterfinals of the 2010 Davis Cup, where they faced France. Ferrer's next tournament was the 2010 BNP Paribas Open. He was the 13th seed, which gave him a bye into the second round. In the second round, he was defeated by James Blake. Ferrer's next tournament was the 2010 Sony Ericsson Open, where he was seeded 15th. In his second-round match, he defeated Michaël Llodra, and then defeated Ivo Karlović. However, in the fourth round, he was defeated by Rafael Nadal. Ferrer then entered the European clay-court swing. His first tournament was the 2010 Monte-Carlo Rolex Masters, where he was seeded 11th. In the first round, he defeated qualifier Peter Luczak, and then defeated Andrey Golubev in the second round. He defeated Ivan Ljubičić in the fourth round. In the quarterfinals, he defeated Philipp Kohlschreiber to advance to the semifinals, where he was again defeated by Nadal. Next, Ferrer participated in the 2010 Torneo Godo, where he was seeded eighth. He had a first-round bye and defeated Marcel Granollers in the second round. In the third round, he crushed Simone Bolelli before Bolelli retired with a wrist injury, and then defeated Thomaz Bellucci in the quarterfinals. In the semifinals, he played Fernando Verdasco. Ferrer was leading Verdasco, 7–6, 4–2, before ultimately losing. Ferrer's next tournament was the 2010 Rome Masters, where he was seeded 13th. In the first round, Ferrer defeated Evgeny Korolev, and in the second round, he defeated Potito Starace. In the third round, he defeated world no. 5 Andy Murray, and then in the quarterfinals, he defeated world no. 10 Jo-Wilfried Tsonga. He faced world no. 9 Fernando Verdasco for a spot in his first Masters 1000 event final. Ferrer ultimately succumbed to Rafael Nadal in the final. Due to his fantastic run in Rome, his ranking increased to world no. 12. Ferrer's next tournament was the 2010 Mutua Madrileña Madrid Open, where he was seeded ninth. In the first round, he defeated Jérémy Chardy and defeated Marcos Baghdatis after fending off a match point. He then defeated Marin Čilić to advance to the quarterfinals. There, he, for the second successive time, beat world no. 4 Andy Murray. In the semifinals, Ferrer lost to world no. 1 Roger Federer in three sets. Ferrer's next tournament was the 2010 French Open, where he entered as a favorite. He began his campaign with a victory over French wildcard David Guez, and then defeated Xavier Malisse when Malisse had to retire. In the third round. he fell to surprise semifinalist Jürgen Melzer. Ferrer's next tournament was the Wimbledon, where he was the ninth seed. In the first round, he defeated Nicolas Kiefer, and then defeated Florent Serra in the second round. In the third round, he defeated Jérémy Chardy in five sets, with Chardy serving for the match at 5–4 in the fifth. In the fourth round, he was defeated by Robin Söderling, again in five sets, despite being two points away from the match on two occasions. Ferrer next played for Spain in the 2010 Davis Cup. He lost his first rubber to Gaël Monfils of France. Spain ultimately lost to France 0–5. Ferrer then traveled to Sweden to play in the 2010 Swedish Open, where he was seeded third. Due to his seed, he received a bye in the first round and defeated Fabio Fognini in the second round. He then defeated Pablo Cuevas in the quarterfinals to advance to the semifinals. Ferrer also extended his ATP best wins on clay in 2010 to 31 wins. However, he lost to Robin Söderling in the semifinals. He was then supposed to play in the 2010 International German Open as the second seed, but had to withdraw due to a shoulder injury. Ferrer's next tournament was the 2010 Rogers Cup, where he was seeded tenth, but lost in the first round to David Nalbandian. Despite his loss, his ranking increased to world no. 11. Ferrer then traveled to Cincinnati to play in the 2010 Western & Southern Financial Group Masters, where he was once again seeded tenth. In the first round, he defeated Alexandr Dolgopolov, and then defeated Sam Querrey in the second round. However, in the third round, he lost to Nikolay Davydenko, despite being up a break of serve twice in the third set. Ferrer's next event was the 2010 US Open, where he was seeded tenth. In the first round, he defeated Alexandr Dolgopolov, and then defeated Benjamin Becker in the second round. He then defeated Daniel Gimeno-Traver for a spot in the round of 16. However, he lost to Fernando Verdasco despite being up 4–2 in the fifth set, and 4–1 in the tiebreaker. Due to Ferrer's appearance in the round of 16, Ferrer was ensured to return to the top 10, to no. 10 in the world. Ferrer then traveled to Malaysia to play in the 2010 Proton Malaysian Open, where he was seed fifth. In the first round, he defeated Bernard Tomic, and then defeated Yuki Bhambri for a spot in the quarterfinals. He then defeated world no. 7 Tomáš Berdych in the quarterfinals. However, in the semifinals, he was upset by Andrey Golubev. Ferrer then traveled to Beijing to play in the 2010 China Open as the eighth seed. In the first round, he defeated Denis Istomin, and then defeated Yen-Hsun Lu in the second round. In the quarterfinals, he defeated Robin Söderling for a spot in the semifinals. In the semifinals, he defeated Ivan Ljubičić for a spot in the finals. However, in the final, he lost to Novak Djokovic in a rain-delayed match. With this run to the final, Ferrer once again returned to the top 10, at world no. 10, and this also put him in the eighth position for qualifying for the year-end championships. Ferrer then traveled to Shanghai to play in the 2010 Shanghai Rolex Masters, where he was seeded 11th. In the first round, he defeated Michaël Llodra, and then defeated Thomaz Bellucci in the second round. However, he was defeated by Robin Söderling in the third round. Due to his round of 16 showing, he moved to no. 8 in the world. Also, he moved to no. 7 in the race to the year-end championships. Ferrer then traveled to Valencia to play in the 2010 Valencia Open 500 as the hometown favorite. At the 2010 Valencia Open 500, he was seeded fourth and defeated Guillermo García-López in the first round. He then defeated qualifier Teymuraz Gabashvili for a spot in the quarterfinals. He then defeated Potito Starace to advance to the semifinals. He then defeated Robin Söderling for a spot in the final. In the final, he defeated Marcel Granollers for the title, his ninth career title. With this victory, he moved to no. 7 in the race to the year-end championships and virtually secured his spot at the 2010 ATP World Tour Finals, and also improved his ranking to world no. 7. Ferrer's final regular-season tournament was the 2010 BNP Paribas Masters, where he was seeded no. 7. Due to his seeding, he received a bye into the second round and defeated Fabio Fognini. However, he lost to Jürgen Melzer in the third round. Despite his loss, Ferrer still qualified for the Barclays ATP World Tour Finals due to the fact that Fernando Verdasco lost his third-round match, sealing Ferrer's seventh spot and his second appearance since 2007. Ferrer then traveled to London to play in the 2010 ATP World Tour Finals, where he was seeded seventh. In his first match, he lost to Federer, and in his second match he lost to Söderling. Ferrer then lost to Andy Murray to finish the 2010 ATP World Tour Finals with an 0–3 record. Ferrer finished the year with a 60–24 record, and once again in the top 10, finishing at world no. 7. Ferrer began his 2011 ATP World Tour season at the 2011 Heineken Open, where he was the top seed. Due to his seeding, he received a bye into the second round and defeated Tobias Kamke. He then defeated Philipp Kohlschreiber to advance to the semifinals, and then defeated Santiago Giraldo for a berth in the final, where he played David Nalbandian. In the final, Ferrer defeated Nalbandian for his first title of the year and the tenth in his career. Ferrer in round-robin action at 2011 ATP World Tour Finals. Ferrer then traveled to Melbourne to play in the 2011 Australian Open, where he was seeded seventh. In the first round, he defeated Jarkko Nieminen, and next defeated Michael Russell in the second round. He then defeated Ričardas Berankis for a spot in the round of 16, where he then defeated Milos Raonic for a spot in his second Australian Open quarterfinal. He beat an injured world no. 1 Rafael Nadal for a spot in the semifinals, winning in three sets. This notably ended Nadal's quest to win four straight majors. He lost to fifth seed Andy Murray in the semifinal. With his run to the semifinals of the Australian Open, his ranking rose to world no. 6. Ferrer then traveled to Rotterdam to play in the 2011 ABN AMRO World Tennis Tournament, where he was seeded third, but lost in the first round to Jarkko Nieminen. Next, Ferrer traveled to Acapulco for the 2011 Abierto Mexicano Telcel, where he was the top seed and defending champion. In the first round, he defeated Adrian Ungur, and then defeated Santiago González in the second round. In the quarterfinals, he defeated Juan Mónaco, and then defeated Alexandr Dolgopolov in the semifinals to advance to his second consecutive final at the Abierto Mexicano Telcel. He defeated compatriot Nicolás Almagro for his second consecutive title in Acapulco and his 11th career title. Ferrer then traveled to Indian Wells to play in the 2011 BNP Paribas Open, where he was seeded sixth. Due to his seeding, he received a bye into the second round, where he lost to big-serving Ivo Karlović. Ferrer then travelled to Miami to play in the 2011 Sony Ericsson Open, where he was seeded sixth. Due to his seeding, he received a bye into the second round, where he defeated qualifier Igor Kunitsyn for a spot in the third round. In the third round, he defeated Somdev Devvarman, and then defeated Marcel Granollers for a spot in the quarterfinals. However, in the quarterfinals, he fell to Mardy Fish, and later said it was due to indigestion. Ferrer then traveled to Europe to begin the clay-court season. His first tournament was the 2011 Monte-Carlo Rolex Masters, where he was seeded fourth. Due to his seeding, he received a bye into the second round, where he defeated fellow Spaniard Feliciano López. In the third round, he defeated Milos Raonic, and then defeated Viktor Troicki for a spot in his second consecutive Monte Carlo semifinal. He dominated Jürgen Melzer in the semifinals to advance to his second Masters 1000 final, where he ultimately fell to Rafael Nadal. Ferrer then traveled back to Spain to play in the 2011 Barcelona Open Banco Sabadell, where he was seeded fourth. Due to his seeding, he received a by into the second round, where he beat Carlos Berlocq, and Victor Hănescu in the third round to reach the quarterfinals. In the quarterfinals, he defeated Jürgen Melzer, and then defeated Nicolás Almagro for a spot in his third Barcelona final. However, in the final, he lost to Rafael Nadal for the second week in a row. Ferrer then traveled to Madrid to play in the 2011 Mutua Madrileña Madrid Open as the sixth seed. Due to his seeding, he received a bye into the second round, where he defeated Adrian Mannarino. He then went on to play Sergiy Stakhovsky, whom he defeated in straight sets. In the quarterfinals, Ferrer lost to Novak Djokovic. It was his first defeat in their four meetings on clay. Ferrer then pulled out of Rome, due to injury, but then traveled to Paris to play in the French Open. At the French Open, Ferrer was seeded seventh. He advanced with easy wins over Jarkko Nieminen, Julien Benneteau, and Sergiy Stakhovsky, before ultimately falling to ninth seed Gaël Monfils in five sets. Due to his round of 16 appearance, Ferrer moved up to no. 6 in the world. Ferrer then took a month off before traveling to London to play in the 2011 Wimbledon Championships, as the seventh seed. In the first round, he defeated Benoît Paire, and then defeated Ryan Harrison in five sets. He then defeated Karol Beck in straight sets to advance to the round of 16. However, he fell to eventual semifinalist Jo Wilfried Tsonga. After competing in two consecutive majors, Ferrer traveled to Sweden to play in the 2011 Swedish Open as the second seed. He reached the semifinals, where he defeated Nicolás Almagro, but lost to Robin Söderling. Ferrer was then set to begin his summer hard-court series in Toronto, but pulled out with a hairline fracture of his left wrist. He healed in time to play in the 2011 Western & Southern Open as the fifth seed. He won his second-round match against Grigor Dimitrov, before falling to Gilles Simon. Due to the result, Ferrer entered the top 5 in the ATP rankings again, becoming world no. 5. At the US Open, he lost in the fourth round to Andy Roddick in four sets. At the 2011 Shanghai Rolex Masters, Ferrer defeated Milos Raonic, former world no. 1 Juan Carlos Ferrero, former world no. 1 and tenth seed Andy Roddick, and Feliciano López on his way to the final that he lost to second seed Andy Murray in straight sets. At the 2011 ATP World Tour Finals, Ferrer's first match was against world no. 3 Andy Murray and the Spaniard won it. In his next match against world no. 1 Novak Djokovic, Ferrer won in just 75 minutes, securing his spot in the semifinals. In the last game of the round-robin stage, Ferrer lost to Tomáš Berdych in three sets. In the semifinals, Ferrer faced the defending champion and world no. 3 Roger Federer and lost in straight sets. In the Davis Cup final in December, Ferrer won his rubber against Juan Martín del Potro in five sets. Ferrer started 2012 by participating in the Mubadala World Tennis Championship held in Abu Dhabi, United Arab Emirates. He defeated world no. 6 Jo-Wilfried Tsonga and world no. 2 Rafael Nadal to reach his first final in the exhibition tournament. In the final, he lost to world no. 1 Novak Djokovic. He won his first tournament of 2012 in Auckland, New Zealand at the Heineken Open ATP 250 (his third Auckland title and 12th Tour title) over Olivier Rochus. At the 2012 Australian Open, Ferrer was seeded fifth, and he defeated Rui Machado, Ryan Sweeting, 27th seed Juan Ignacio Chela, and 17th seed Richard Gasquet on his way to the quarterfinals. He then faced world no. 1 Novak Djokovic and lost in straight sets. Ferrer was seeded first at the 2012 Copa Claro tournament and won it, defeating 2011 champion and second seed Nicolás Almagro. It was Ferrer's second title of the year and 13th of his career. His third singles title of the year and 14th overall came in Acapulco, Mexico a week after his win in Argentina. He beat fellow Spaniard Fernando Verdasco in the final, losing only three games. At the 2012 Sony Ericsson Open, Ferrer beat Bernard Tomic, Julien Benneteau, and 2009 US Open champion Juan Martín del Potro in straight sets to reach the quarterfinals, where he faced world no. 1 Novak Djokovic. Ferrer lost in straight sets. At the 2012 Monte-Carlo Rolex Masters he was seeded fifth, but was upset in his second-round match by Brazilian Thomaz Bellucci. The following week, Ferrer reached the final at the 2012 Barcelona Open Banco Sabadell, after winning over Filip Krajinović, Albert Montañés, Feliciano López, and Milos Raonic. He then lost the final to defending champion Rafael Nadal. At the 2010 Muatua Madrid Open, held for the first time on blue clay, Ferrer defeated Radek Štěpánek and Nicolás Almagro on his way to the quarterfinals. He then faced world no. 3 and eventual champion Roger Federer and lost in straight sets. At the 2012 Internazionali BNL d'Italia, Ferrer was seeded fifth and defeated Fernando Verdasco, Gilles Simon, and Richard Gasquet on his way to the semifinals. There he lost to eventual champion Rafael Nadal. At the 2012 French Open, Ferrer lost only 25 games defeating Lukáš Lacko, Benoît Paire, Mikhail Youzhny, and Marcel Granollers on his way to the quarterfinals. There he won over world no. 4 Andy Murray and reached his first Roland Garros semifinal. He then lost to defending champion Rafael Nadal, 6–2, 6–2, 6–1. Ferrer won his fourth singles title of the year and 15th overall in 's-Hertogenbosch, Netherlands. He beat Pierre-Ludovic Duclos, Leonardo Mayer, Igor Sijsling, Benoît Paire, and Philipp Petzschner on his way to his second grass singles title. Ferrer then reached the quarterfinals of Wimbledon, defeating Dustin Brown, Kenny de Schepper, Andy Roddick, and Juan Martín del Potro. Ferrer made it to the last eight for the first time at the tenth attempt. Ferrer then went on to lose the match to Andy Murray in a four-set thriller. Ferrer entered the quarterfinals of Swedish Open by defeating Simone Bolelli. He eventually advanced to the finals, where he defeated countryman Nicolás Almagro for his fifth title of the year. At the US Open, Ferrer made it to his fourth career Grand Slam semifinal, where he lost in four sets to Novak Djokovic. The semifinal had to be played over two days because of the threat of a tornado on the final Saturday. He had previously defeated Kevin Anderson, Igor Sijsling, Lleyton Hewitt, Richard Gasquet, and Janko Tipsarević en route to the semifinals. Ferrer won his sixth title of the season in Valencia, defeating Alexandr Dolgopolov in the final. Ferrer won his first Masters 1000 title in Paris at the end of the season, beating Jo-Wilfried Tsonga in the quarterfinals, Michaël Llodra in the semifinals, and Jerzy Janowicz in the final. This was also his seventh ATP Tour-level title of the year, the most of any player that season. He also won more matches that year than any other player, male or female. In late 2012 Ferrer faced questions about his involvement with doping doctor Luis Garcia del Moral. Ferrer started his 2013 season by successfully defending his Heineken Open title defeating Philipp Kohlschreiber in straight sets. At the Australian Open, Ferrer came back from two sets down to defeat fellow Spaniard Nicolas Almagro in the quarterfinals. In his semifinal match he was thrashed by eventual champion Djokovic in straight sets, winning only five games. Following the continued absence of Rafael Nadal from the ATP Tour, Ferrer became the Spanish no. 1 for the first time in his career, re-entering the top 4 in the rankings on 28 January 2013. Ferrer then won his second title of the year at the Copa Claro defeating Stanislas Wawrinka in three sets. but lost to Nadal in the 2013 Abierto Mexicano Telcel final in Acapulco, winning only two games. He then suffered an early loss at the 2013 BNP Paribas Open, falling to Kevin Anderson in his first match of the tournament. He then reached the final of Miami Masters after outlasting Jürgen Melzer and Tommy Haas, but lost to Andy Murray after holding a championship point in the deciding set, Ferrer moved back into the top 4 as a result. Ferrer withdrew from Monte Carlo and was upset by Dmitry Tursunov at the Barcelona Open Banco Sabadell. Ferrer reached his fifth final of the year at the Portugal Open facing Wawrinka, but this time falling in straight sets to the Swiss. He then lost to Nadal in back-to-back quarterfinals in the Masters event of Mutua Madrid Open and Internazionali BNL d'Italia. At the French Open, Ferrer reached his first Grand Slam final without dropping a set. He defeated three of his compatriots, Albert Montañés, Feliciano López, and Tommy Robredo, all in straight sets, to reach his sixth Grand Slam semifinal. He then defeated sixth seed Jo-Wilfried Tsonga to reach the final, where he was defeated by defending champion Rafael Nadal. Despite failing to win the title, Ferrer regained the world no. 4 spot from Nadal on the basis of earning more points than the previous year, while Nadal defended his entire points total from 2012. At the 2013 TOPSHELF Open in 's-Hertogenbosch, Ferrer went out in the first round to veteran Belgian Xavier Malisse despite being the defending champion. His next tournament was Wimbledon, where he made it to the quarterfinals for the second consecutive year before falling to Juan Martín del Potro in straight sets. Ferrer had disastrous US Open tune-ups at the 2013 Rogers Cup and 2013 Western & Southern Open, winning only one match and losing to Russians Alex Bogomolov, Jr. in the second round and Dmitry Tursunov in the third round. He rebounded at the US Open, losing to Richard Gasquet in the quarterfinals in five sets despite taking the third and fourth sets, in his first loss since 2008 to the Frenchman. He then reached another final, at the If Stockholm Open facing Grigor Dimitrov, but lost in three sets to hand the Bulgarian his first title. Ferrer then followed it up with another final appearance at the Valencia Open 500, where he was the defending champion. However, he fell to Russian Mikhail Youzhny in straight sets. He reached his third final in as many weeks at the BNP Paribas Masters, where he was the defending champion after defeating world no. 1 Rafael Nadal, ending his nine-match losing streak to the Spaniard. However, he lost to Novak Djokovic in straight sets, despite serving for each set in the tenth game. This was Ferrer's seventh consecutive loss in a final. A big change in December was his parting with coach Javier Piles, who had been his coach from the beginning of his career. He did not win any matches at the year-end championships for a disappointing end to the year. However, he had his best year-end finish in the rankings at no. 3. Ferrer began his 2014 season losing to Daniel Brands in the second round of the Qatar Open. He reached the semifinals of the Heineken Open, where he was defeated by Lu Yen-hsun. Ferrer reached the quarterfinals of the 2014 Australian Open, where he lost to Tomas Berdych in four sets. In February, Ferrer successfully defended his title at the 2014 Copa Claro, which was his first title of the year. In 2014 Rio Open semifinals, Ferrer was defeated by Alexandr Dolgopolov in straight sets. At the 2014 Abierto Mexicano Telcel quarterfinals, Ferrer retired against Kevin Anderson due to leg injury. Ferrer made his return in the 2014 Sony Open Tennis reaching fourth round before losing to Kei Nishikori after squandering four match points. He made the semifinals of the 2014 Monte-Carlo Rolex Masters. In the quarterfinals, he beat Rafael Nadal for the first time in 10 years on clay, before losing to Stanislas Wawrinka in the semifinals. He made the semifinals again at the 2014 Mutua Madrid Open, where he lost to Kei Nishikori. He was defeated by Novak Djokovic in the quarterfinals at the 2014 Internazionali BNL d'Italia. Ferrer made it to the 2014 French Open quarterfinals. He lost to world no. 1 and compatriot, Rafael Nadal, in four sets. Ferrer was defeated by world no.118 Andrey Kuznetsov in the second round of the 2014 Wimbledon Championships ending his 10 grand slam quarterfinal streak. He made it to the quarterfinals in the 2014 Swedish Open before losing to Carlos Berlocq in straight sets. He made it to the final of the 2014 International German Open. In the final, he was defeated by Leonardo Mayer. He began his American Swing by reaching quarterfinals of the 2014 Rogers Cup before losing to Roger Federer. He made it to the final of the 2014 Western & Southern Open. In the final, he was again defeated by Roger Federer. However, 2014 US Open became a disappointment, when he was defeated by Gilles Simon. Ferrer was upset by Viktor Troicki at the 2014 ATP Shenzhen Open. He continued to struggle in the Asian Swing by bowing out against Marcel Granollers in the 2014 Rakuten Japan Open Tennis Championships. He improved in the 2014 Shanghai Rolex Masters by defeating Martin Klizan and Andy Murray both coming from a set down. He lost to Novak Djokovic in the quarterfinals. Ferrer made it to the final of the 2014 Erste Bank Open. There, he was defeated by Andy Murray. He made it to the quarterfinals of the 2014 BNP Paribas Masters.F before losing to Kei Nishikori. As a result, he failed to qualify for the 2014 ATP World Tour Finals, but later replaced Milos Raonic in the group phase when the latter had to withdraw due to an injury. He lost his match against Kei Nishikori in three sets and finished the year ranked no.10. In 2014 Ferrer won 2 time and Murray and 1 time Rafael Nadal. Ferrer began his 2015 season at the Qatar ExxonMobil Open, where he was seeded fourth. There, he won his 22nd ATP World Tour title by defeating Tomáš Berdych in the final in straight sets. He was then scheduled to play at the Heineken Open in Auckland a week later, but withdrew due to fatigue. At the 2015 Australian Open, he made it to the fourth round, losing to Kei Nishikori. In February, Ferrer won back-to-back titles at the 2015 Rio Open and 2015 Abierto Mexicano Telcel by defeating Fabio Fognini and Kei Nishikori, respectively. In May, Ferrer made the semifinals of the Rome Masters, before being defeated by Novak Djokovic, matching his best performance at the tournament since 2012. Next, Ferrer competed at the 2015 French Open getting through the first two rounds without dropping a set. Then, Ferrer fought Simone Bolelli in the third round in a close five-setter, as well as defeating Marin Cilic in straight sets to reach his fourth French Open quarterfinal, before losing to Andy Murray in four sets. However, Ferrer lost his first match on grass at Queen's Club and withdrew from Wimbledon due to an elbow injury. He was eliminated early at the US Open. Ferrer proceeded to win his 25th career title at the Kuala Lumpur Open, defeating compatriot Feliciano López. This marked the first ever all-Spanish final and Ferrer became the first ever Spaniard to win the title in Kuala Lumpur. Winning the title, he also maintained his 4–0 wins in finals in 2015. He continued his winning streak by winning the Ersta Bank Open in Vienna, defeating Fabio Fognini, Gaël Monfils and Steve Johnson to bring his finals record in 2015 to 5–0. Ferrer started his season in an exhibition at the Mubadala World Tennis Championships. Ferrer easily defeated Jo-Wilfried Tsonga and then lost to Rafael Nadal in a close three-setter. Ferrer then played Stan Wawrinka for the third place match. Ferrer lost the first set, but came back to win. Ferrer then arrived at the Qatar Open as the fourth seed and defending champion. Ferrer lost in the first round to Illya Marchenko, despite winning the first set. Ferrer then competed at Auckland as the top seed. Ferrer made it through to the semifinals after defeating qualifier Matthew Barton and Lukáš Rosol, but lost to Jack Sock despite winning the first set. Ferrer then played in the first Grand Slam of the year at the Australian Open. Ferrer defeated qualifier Peter Gojowczyk in the first round. In the second round, Ferrer defeated Lleyton Hewitt, who was playing his last career singles match. Ferrer then defeated 31st seed Steve Johnson and 10th seed John Isner. Ferrer reached the quarterfinals without having lost a set. In the quarterfinals, Ferrer lost to second seed and eventual finalist Andy Murray in four sets. Ferrer then arrived as second seed at the Argentina Open. Ferrer defeated wildcard Renzo Olivo in straight sets. Ferrer then defeated eighth seed Pablo Cuevas in three sets, before losing to Nicolás Almagro in straight sets in the semifinals. Ferrer then arrived at the Rio Open as the second seed. Ferrer defeated wildcard Nicolás Jarry in straight sets. Ferrer then came from a set down to defeat Albert Ramos-Viñolas. Ferrer's tournament came to an end in the quarterfinals when he lost to fifth seed Dominic Thiem in straight sets. Ferrer fell in the second round of the Mexican Open to Alexandr Dolgopolov and the second round of the Miami Open to Lucas Pouille to end his hard-court season. To begin the clay-court season, Ferrer competed at the Madrid Open, defeating both Guillermo García-López and Denis Kudla in three sets, before falling to Tomáš Berdych in straight sets. He followed this up with another third-round appearance in the Rome Masters, this time losing to Pouille in straight sets. He began the French Open well, defeating Russia's Evgeny Donskoy. He went on to take down Juan Mónaco and Feliciano López before again falling to Berdych in straight sets. The grass-court season did not go nearly as well, bowing out in the first round of Halle to Andreas Seppi and the second round of Wimbledon to Nicolas Mahut. The hard-court season began with the Olympics for Ferrer. Ferrer got through the first round against Denis Istomin, before falling to Donskoy in a tightly contested match. The Cincinnati Masters saw another first-round exit, this time at the hands of Julien Benneteau. Ferrer began the US Open by defeating Dolgopolov in the first round and Fabio Fognini in the second, before falling to an in-form Juan Martín del Potro in the third round, matching his performance of the previous two years at the tournament. After playing in two 250-level Pacific warm-up events, Ferrer competed in the 2017 Australian Open. He defeated two qualifiers before falling to compatriot Roberto Bautista Agut in the third round. This marked Ferrer's earliest exit at the tournament since 2010. In July of the same year, Ferrer won his first tournament since October 2015 at the 2017 Swedish Open, defeating Ukrainian Alexandr Dolgopolov in the final. In the Cincinnati Masters, Ferrer defeated world No. 8 Dominic Thiem to reach the semifinals where he lost to Nick Kyrgios in two tiebreak sets. In his final grand slam appearance, Ferrer was drawn to face compatriot and long-time rival Rafael Nadal in the opening round of the 2018 US Open. The match came to a premature end in the middle of the second set when Ferrer was forced to retire from the match with a calf injury. On 15 August 2018, Hopman Cup organisers announced that Ferrer would represent Spain at the 2019 edition alongside Garbiñe Muguruza. It will be his debut appearance at this tournament. On 28 August 2018, Ferrer announced that the 2019 season would be his last in the tour. He also announced a preliminary list of 6 tournaments in which he wants to compete during his final season: the Hopman Cup, Auckland, Buenos Aires, Acapulco, Barcelona and Madrid. At the Miami Masters, Ferrer battled from a set down to defeat world number 3 Alexander Zverev. This was Ferrer's first top 3 victory in almost 5 years. Ferrer is noted for being one of the more dogged, agile, and fit players on the tour, and he has won many matches with consistent baseline play, great fitness, footspeed, and determination. Although he does not possess powerful groundstrokes like many of his contemporaries, his ability to keep the ball deep in play and move his opponents around the court has allowed him to be successful on all surfaces, especially on clay and hard courts. Although he is not a great net player, Ferrer's speed allows him to quickly cut off his opponents' shots and volley whilst they are off balance. Darren Cahill has said that Ferrer and Novak Djokovic are the two best returners in the men's game, even surpassing former dominant return specialists like Andre Agassi, who Cahill previously regarded as the best return specialist in the history of men's tennis. In 2007, Roger Federer regarded Ferrer as the best returner in the men's game. At a personal level, Ferrer's reputation on the tour is that of a humble and shy person, rarely being involved in any controversy throughout his career. Calm and disciplined, he is admired for his tenacity and competitiveness on the court. Due to his speed, defensive prowess and lack of significant power, many have compared Ferrer's playing style to that of former US Open and Wimbledon champion Lleyton Hewitt. In February 2016, Ferrer featured in a video by the ATP titled "Ferrer Getting Better and Better". It highlighted the longevity of Ferrer's career, his fighting spirit, consistency and the success he has been able to achieve even at the age of 36. It pointed out that, despite his long career, Ferrer had his second best season in 2015. Ferrer has the most match wins, the most tournament wins, and the most Grand Slam match wins of all players who have not won a Grand Slam. In the video, Ferrer also reveals that his tennis idol growing up was Sergi Bruguera. Ferrer supports Valencia CF. He also enjoys playing basketball. On 28 November 2015, Ferrer married his long-time girlfriend, Marta Tornel. The couple were introduced by Martin Solibakke and his wife. Tornel has a degree in optometry and works at her family's opticians in Benifaió. On May 4, 2018, Ferrer and Tornel announced the birth of a son, Leo, via social media. Ferrer and Murray have faced each 20 times (not including one occasion when there was a walkover in favour of Murray), with Ferrer trailing in their head-to-head, 6–14. Ferrer leads 4–1 on clay, while Murray leads on hard courts 12–2, and 1–0 on grass. They have met each other five times at Grand Slam tournament level, which Murray leads 4–1. The first was at 2011 Australian Open, which Murray won after losing the first set. They would meet again in 2012 Roland Garros, which Ferrer won losing the second set in a tie-breaker, and 2012 Wimbledon, with Murray scoring the win in a four set match. The next two matches occurred at the 2015 Roland Garros and the 2016 Australian Open, which Murray won, despite Ferrer managing to win a set off Murray in both matches. During the rivalry, they have only met three times at the Barclays ATP World Tour Finals, with Murray leading 2–1. Ferrer and Verdasco have faced each 21 times, with Ferrer leading in their head-to-head, 14–7. Ferrer leads 6–4 on clay and 8–2 on hard courts, while Verdasco leads 1–0 on grass. They have only had two meetings at a Grand Slam tournament level, with both matches going to Verdasco. The first took place 2007 Roland Garros, which Verdasco won after losing the first set (4–6, 7–6(2), 6–3, 6–3). The second meeting occurred at 2010 US Open, which Verdasco won in a five-setter match (5–7, 6–7(8), 6–3, 6–3, 7–6(4)). Ferrer and Lopez have faced each 19 times, with Ferrer leading in their head-to-head, 11–8. Ferrer leads 7–3 on clay, while Lopez leads on hard courts 5–4. They have met each other three times at Grand Slam tournament level. The three meetings took place at Roland Garros, with Ferrer winning two and Lopez winning one. The pair first met each other in the semifinals of New Haven 2005, which Lopez won in three sets. Ever year after 2005 they competed against each other, with 2010 being the exception. No matches were played on that year. Ferrer and Berdych have met 16 times, with both players sharing even wins against one another. Their head-to-head is 8–8. Ferrer trails against Berdych 2–4 on clay, whereas he leads 5–3 on hard courts, and is tied at 1–1 on grass. Their first meeting was at the Gstaad Open, with Ferrer winning. They have only met each other three times at Grand Slam tournament level, with Berdych leading 3–0. The first was in the 2014 Australian Open, which Berdych won after losing the third set. Their second meeting was at the 2016 Roland Garros, which Berdych won in three straight sets. Their third encounter was at 2017 Wimbledon Championship, where Berdych won again in straight sets. In addition, they have faced each other twice at the Barclays ATP World Tour Finals and once in the Davis Cup, with Berdych leading 2–0 and Ferrer leading 1–0 respectively. Despite playing 16 matches against each other, they have only played in one tiebreaker against each other, this was at the 2016 Mutua Madrid Open which Berdych won 10–8 in the opening set. He went to win the match in straight sets. For multiple reasons, both Ferrer and Berdych have been considered the greatest players of all time to not have won a Grand Slam. Ferrer and Wawrinka have met 14 times, with both player scoring equal wins against one another. Ferrer and Wawrinka are even on clay 3–3, while Ferrer trails against Wawrinka 3–4 on hard courts; Ferrer leads 1–0 on grass. Despite meeting on many occasions, they have never played against each other at Grand Slam level. There have been two encounters at Barclay ATP World Tour Finals in the years of 2013 and 2015, which Wawrinka won, and one encounter at the Davis Cup in 2010, with Ferrer beating Wawrinka in straight sets. Ferrer and Nishikori have met 14 times, with Nishikori leading 10–4. Their first encounter was at 2008 US Open with Nishikori beating Ferrer in a five-set thriller. They next met again from 2011–2013 with Ferrer winning 3 times in straight sets and Nishikori winning only once in the Olympics at 2012 in three sets. However, throughout 2014, they met four times, with every match won by Nishikori. They first met in 2014 in the Miami Masters with Nishikori beating Ferrer in 3 tight-sets after saving 4 match points to progress to the QF. They next had an epic encounter at the Madrid Open with Nishikori beating Ferrer in another tight 3-setter to progress to the final of a Masters 1000. Their next 2 encounters were in the BNP Paribas Masters and the ATP World Tour Finals where Nishikori again defeated the Spaniard in 3 sets. In 2015, Ferrer had a remarkable start to the season but was beaten in the Australian Open by Nishikori in straight sets. However, Ferrer ended his losing streak to Nishikori in the 2015 Abierto Mexicano Telcel, where he beat Nishikori in straight sets in the final. In Madrid, in the quarterfinals, Nishikori took revenge and beat him in straight sets. Current through the 2019 Miami Open. ^ "Rankings - Singles - ATP World Tour - Tennis". ^ "Rankings | Singles | ATP World Tour | Tennis". ATP World Tour. Retrieved 2019-04-08. ^ Ford, Bonnie D. (6 September 2007). "Golden Arches only option for David Ferrer". ESPN. Retrieved 22 January 2010. ^ Katy Murrells (6 June 2012). "Andy Murray v David Ferrer – as it happened". London: theguardian.com. Retrieved 2 February 2014. ^ Bergeron, Tom (31 August 2008). "US Open: Kei Nishikori, 18, stuns No. 4 David Ferrer". New Jersey Sports. Retrieved 22 January 2010. ^ "Marcos Baghdatis wins from two sets down at Australian Open". Herald Sun. 22 January 2009. Retrieved 22 January 2009. ^ "David Ferrer beats Almagro to win Copa Claro". Retrieved 27 February 2012. ^ "David Ferrer". The Times Of India. Archived from the original on 7 June 2012. Retrieved 7 June 2012. ^ "David Ferrer". The Times Of India. Archived from the original on 8 June 2012. Retrieved 8 June 2012. ^ "Andy Murray, David Ferrer set-up Wimbledon quarter-final clash". 3 July 2012. ^ "Ferrer claims second Bastad title". Fox News. 15 July 2012. ^ "David Ferrer rallies to win Copa Claro". ESPN. 26 February 2013. ^ "Murray beats Ferrer to win Miami Masters". Australian Broadcasting Corporation. 1 April 2013. Retrieved 2 February 2014. ^ "Wawrinka beats Ferrer to win Portugal Open". USA Today. Associated Press. 5 May 2013. ^ "Rafael Nadal beats David Ferrer to win eighth French Open title". BBC. 9 June 2013. ^ "Richard Gasquet reverses fortune". ESPN. 4 September 2013. ^ Dawes, Mike (20 October 2013). "Dimitrov wins first ATP Tour title after outlasting Ferrer in Sweden". London: Daily Mail. ^ "Youzhny overcomes top-seeded Ferrer to win Valencia Open". Sports Illustrated. 28 October 2013. ^ "Ferrer Beats Nadal to Reach Final in Paris". NY Times. 2 November 2013. ^ "Novak Djokovic wins sixth title of '13". ESPN. 3 November 2013. ^ "Ferrer splits from coach Javier Piles". ^ "Ferrer Takes Giant Stride With Vienna Title – ATP World Tour – Tennis". ^ "Rafael Nadal pays tribute to David Ferrer after Retirement in final Grand Slam appearance". METRO. 28 August 2018. ^ "Muguruza, Ferrer for Spain, Tsitsipas and Sakkari for Greece in 2019". Hopman Cup. 15 August 2018. Retrieved 21 October 2018. ^ Burgos, Jesús (28 August 2018). "David Ferrer anuncia su retirada para 2019" [David Ferrer announces his retirement for 2019] (in Spanish). Diario Sport. Retrieved 3 October 2018. ^ "Djokovic dispatches Ferrer to set up Murray showdown", ESPN, 9 September 2012. ^ "David Ferrer's Elite Return Game", The Daily Fix, 26 January 2011. ^ "Harwitt: Five things we learned in Shanghai". ^ "News – ATP World Tour – Tennis". ^ ATPWorldTour (16 February 2016). "Ferrer Getting Better And Better" – via YouTube. ^ "David Ferrer". ATP World Tour website. Retrieved 12 July 2017. ^ "David Ferrer: Biography". Prince Tennis. Archived from the original on 22 August 2014. Retrieved 2 August 2014. ^ "ATP star David Ferrer ties the knot in Valencia; Rafael Nadal attends Marc Lopez Mallorca wedding". International Business Times AU. Retrieved 8 December 2015. ^ Oberjuerge, Paul (29 December 2011). "Well-read David Ferrer thrives at number five ranking". The National. Retrieved 2 August 2014. ^ Willecoq, Guillaume. "In the Library of...David Ferrer". We are Tennis. Retrieved 2 August 2014. ^ Davis, Robert (16 November 2011). "Ferrer's Iron Will". ATP World Tour. Retrieved 2 August 2014. Wikimedia Commons has media related to David Ferrer.